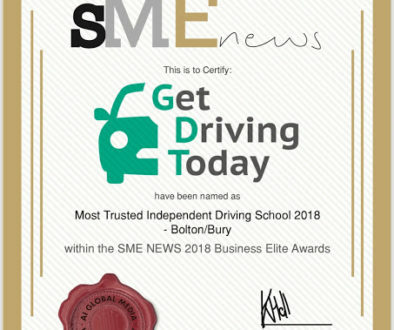 MIBBA’S 2018 – THE MADE IN BURY BUSINESS AWARDS "Get Driving Today – adding another award to our “Officially the Most Trusted Independent Driving School 2018 - SME News." As a local boy – born and bred in Bury (Radcliffe to be precise) – I’ve always been supportive of local businesses and charities. Setting up my driving school ‘Get Driving Today’ – based primarily in Bury and Bolton – is something I’m proud of. Entering the local awards a few years ago seemed the right thing to do. We first entered the MIBBA’s 5 years ago and have taken home an award (or three) every year. This year was different! Ohwe took home an award but somehow it felt better! Why is this year any different? Well, the awards have grown – massively. Originally entered by smaller growing businesses it is now extremely competitive and entered by much larger well-established businesses. The kudos of ‘winning’ has grown. The level of entry has soared, and the competitive edge is razor sharp. The winner of our category also took home Best in Class – Large Business! It’s a long awards procedure, from entry in early July to interviews in September, with a judging panel consisting of 5 leading business owners. 10 minutes to showcase your business and why you think you should win! Sweaty palms time. Only 6 businesses get through from entry to judging day, so for hard fought categories it’s an achievement to get that far. These 6 are whittled down to 3 for the actual awards night. On judging day you need to be a little bit ‘inventive’ so I took Brian – our chimpanzee mascot. On a normal working day he’s sat on the dashboard, next to the dashcam. I spruced him up, dusted him off and rolled him out. For those that know me – you’ll get the Brian thing!….. For those that don’t feel free to ask. Was I disappointed in not winning? In all honesty yes, but only because I feel that committed to Get Driving Today and what we’ve accomplished over the last 11 years. I am without doubt over the ‘piggin’ moon with our award. The recognition of what we’ve achieved (so far), the lives we change by getting our learners through their test, is the best feeling in the world. Why we’re different – we specialise in working with learner drivers suffering from stress and anxiety, and we care. We specialise in working with people who suffer from anxiety, stress, dyspraxia etc. If you’ve had a bad experience in the past with a driving instructor don’t give up. If you have a driving licence but don’t drive because you lack confidence, had a bad experience or just want a refresher – we can help. No one is a lost cause where Get Driving Today is concerned. You may have decided that – another driving instructor may have told you that – but you haven’t met us yet! We DO make a difference and we CAN help. James suffers with severe dyspraxia and passed with Get Driving Today in September 2017. Read James’s full review – nothing says it better than a satisfied customer. Now – bring on 2019 and that entry form. MIBBAs 2019 we’re coming to get you. Start 2019 with a bang. 10 Hours of in car tution. FREE UNLIMITED theory test practice.